The Bill & Melinda Gates Foundation undertook, in 2017, to publish a ‘Goalkeepers Report’ every year until 2030, charting the world’s progress towards the Sustainable Development Goals, which have 2030 as their target date. The co-chairs’ introduction to the report (and on the ‘Goalkeepers’ page on the Foundation’s website), is entitled ‘Is Poverty Inevitable’? They go on to explain that usually, they express their optimism “by highlighting some of the recent mind-blowing developments in the human condition,” such as the fact that more than one billion people have lifted themselves out of poverty since 2000. Sometimes, though, “optimism requires being candid about the hard problems that still need to be solved,” the introduction says. The crux of the Goalkeepers 2018 report rests on current population numbers and projections: Africa’s population is predicted to increase by 51% between their 2017 baseline and 2050, while all other regions in the world are projected to experience population declines of between 6% and 41% in that same time period. Nearly 60 percent of Africans are under the age of 25, compared to 27 percent of Europeans; the median age across Africa is 18, compared to 35 in North America (or 47 in Japan). However, the co-chairs also say that the development of human capital is the key to unlocking a successful future for Africa, by investing in young people’s health and education. “If young people are healthy, educated, and productive,” they say, “there are more people to do the kind of innovative work that stimulates rapid growth,” which ultimately would be extremely good news for the economy, at all levels. The report’s conclusion and ‘global data’ section includes some global health data on: HIV, TB and malaria (pages 44-45), as well as vaccines, stunting, maternal mortality, under-5 mortality, neo-natal mortality, neglected tropical diseases, family planning, universal health coverage (UHC), smoking and sanitation. There is also a separate section on HIV, comprising a ‘future scenarios’ view of Zimbabwe’s HIV epidemic. 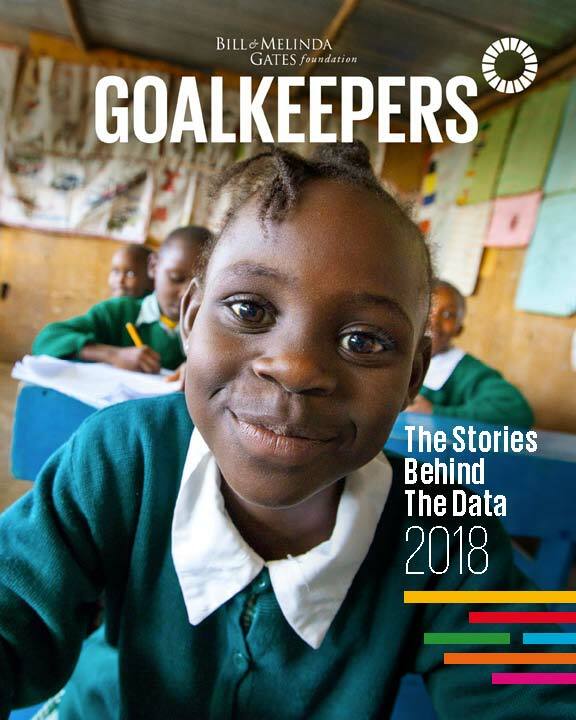 To read Bill and Melinda Gates's introduction and to download the Goalkeepers Report 2018, click here.